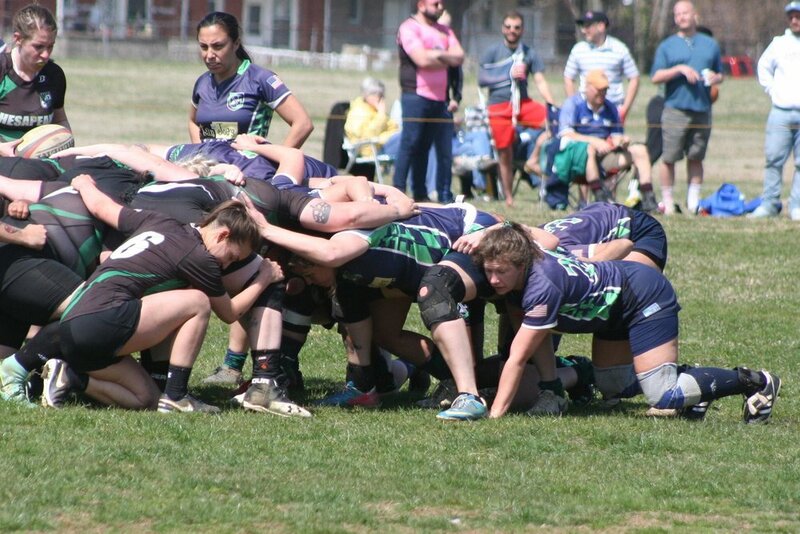 This past Saturday, the Severn River Honey Badgers travelled to Baltimore for their second Division match of the spring. After fighting a bit of traffic from the relentless construction on 895, the Honey Badgers composed themselves and took to the pitch against rival team Baltimore Chesapeake. In 2006, Meredith McAlister and Chelsea Renoe split from Baltimore Chesapeake to form the women’s team for Severn River and neither side has been comfortable with the other since. The Honey Badgers took the opportunity to try different configurations in both the backs and the forwards. This kind of flexibility will serve them well heading into Regionals and hopefully Nationals once again. After a hectic start that found the Honey Badgers on their heels, the team reorganized and put together an excellent series of phases that led to the first of two tries for veteran Farrah Douglas. She followed her first try with a second just two minutes later and then let the younger Badgers get some glory of their own. Mikey Williams also added two tries in the first half with returning veteran, Denisse Villaran, adding one of her own. The floating offsides line seemed to frustrate both teams and made Chesapeake’s blitz style of defense particularly difficult to read in the first half. Luckily, the strong forwards play helped the Honey Badgers to a 33-0 lead as they maintained ball control in the first half and set the backs for success after the break. The second half featured six tries from the back line led by wings, Tiffany Paul and Aly Jost McCarty, who each had two scores on the day. Mikey Williams, in an impressive breakaway run, added another score to complete her trifecta. Chesapeake responded well to the frustration of the first half and added two tries and one conversion in the second half. Their relentless defense and strong presence in the scrums were a challenge for Severn River at many points throughout the match.